Casa tapestry shows a fantastic verdure showing the trees of the forest with the village house in the background. In the midground we see a bridge and boat that transports the villagers and the viewer from one to the other. The use of color and texture is beautiful in this piece, with the use of greens and sophisticated blue greens among the gold and browns. The background of mountains and a castle perched on the top of a mountain creates an atmospheric setting for this scene. An elaborate leaf motif border completes the work. 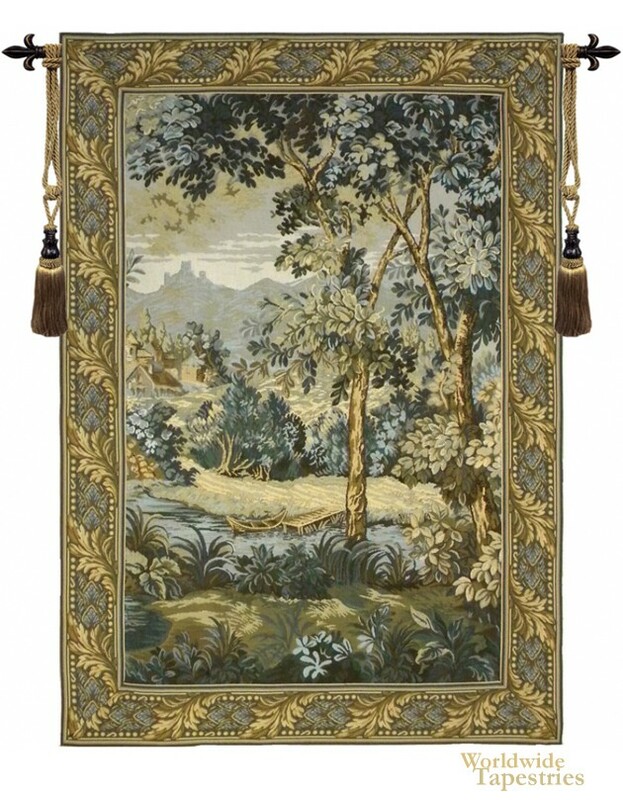 This La Casa landscape tapestry is backed with a lining and a tunnel for easy hanging. Note: tapestry rods and tassels, where pictured, are not included in the price. Dimensions: W 40" x H 62"